Kolie grew up in South Africa and tennis has always been a big part of his life. He began tennis in the way many kids do, with a tennis ball against the garage wall, and went on to represent South Africa in Japan, the USA and throughout Africa as a junior tennis player, resulting in being a 3-time national champion. Kolie completed his final year of high school at the Saddlebrook Tennis Academy in Florida, USA where he had the opportunity to play ITF tennis tournaments and played against some of the best players in the world including Andy Roddick, Michael Russell and Thomas Haas. He was also the practice partner for Jennifer Capriati. After high school he travelled for one year playing professional tournaments throughout the world. He then received a full tennis scholarship to the University of Alabama at Birmingham where the team reached a ranking of top eleven, Division One tennis in his junior year of university. Kolie has coached tennis in both Alabama and Boston, USA to people of all ages and abilities over a ten year period. He has also worked with ITF level juniors and travelled with them throughout the USA for tournaments. He was a tennis coach at Bosse Sports and Health Club in Boston for five years. 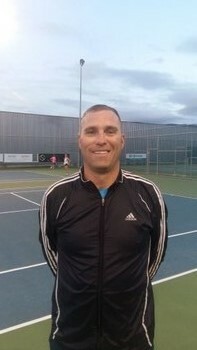 Kolie moved to NZ with his wife Nicole in 2010 and has been the head coach at the Tasman Tennis Club since 2011. He is a registered TNZ coach and has nearly completed his Club Professional Coaching qualification through Tennis Australia. Kolie loves working with both children and adults to foster their love of tennis and share his passion for the sport. Kolie and his wife have two young children and enjoy the outdoor lifestyle that the region has to offer, particularly spending time at the beach. Tennis Hot Shots coaching and community play club.